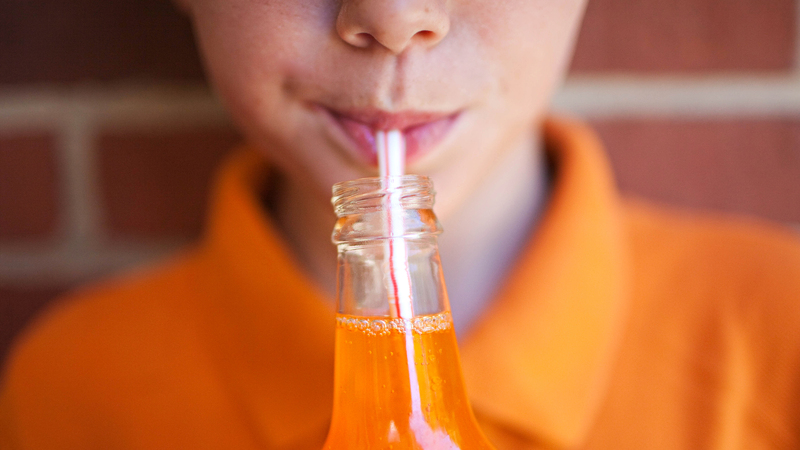 Now, the nation's leading group of kids' doctors, the American Academy of Pediatrics, together with the American Heart Association, has endorsed a range of strategies designed to curb children's consumption — including taxes on sugary drinks, limits on marketing sugary drinks to kids and financial incentives to encourage healthier beverage choices. "For children, the biggest source of added sugars often is not what they eat, it's what they drink," says Natalie Muth, a pediatrician and the lead author of the new joint policy statement. By one estimate, kids and teens get about 17 percent of their calories from added sugars — and about half of those calories come from drinks. While consumption of sugary drinks has declined in the U.S., kids and teens still consume about 150 calories a day, on average, from them. That's about 12 ounces per day. But the heart association recommends that children consume no more than 8 ounces per week. "There's a huge difference between what a typical child is drinking ... and what the recommendations are," Muth says. By one estimate, sweetened beverages account for at least one-fifth of the weight gained between 1977 and 2007 among people in the U.S. The new statement calls on local, state and national policymakers to consider raising the price of sugary drinks. Muth says taxes on sugary drinks have been shown to be successful. She says taxes are "a great example of a way to increase the price of sugary drinks, which we know decreases consumption." The AAP and the AHA note that such taxes are already in place in U.S. cities including Berkeley, Calif., and Philadelphia. The soda industry has spent millions of dollars to fend off soda taxes. And the American Beverage Association argues there is a better way to reduce the amount of sugar consumers get from beverages. "We are supporting parents who want less sugar in their kids' diets by creating more drinks than ever before with less or no sugar," says William Dermody, spokesperson for the ABA. "Today, 50 percent of all beverages sold contain zero sugar as we drive toward a goal of reducing beverage calories consumed by 20 percent by 2025." The new joint policy statement also called on federal and state governments to support efforts to decrease the marketing of sugary drinks to children and teens. "As a nation we have to say 'no' to the onslaught of marketing of sugary drinks to our children," Rachel Johnson, a professor emeritus of nutrition at the University of Vermont and the former chair of the AHA's nutrition committee, said in a statement. "We know what works to protect kids' health and it's time we put effective policies in place that bring down rates of sugary drinks consumption, just like we've done with tobacco."